Steven Gerrard and Xavi Hernandez were both born in 1980 (the same year that I was born). Last Saturday, Gerrard celebrated his 35th birthday; Xavi celebrated winning the Spanish Cup. Gerrard had hoped that his own celebrations would coincide with an appearance in the FA Cup final at Wembley but Liverpool’s miserable end of season form put paid to any chance of that. Gerrard and Xavi are two magnificent midfielders who have both been one club men until now (both are off to enjoy end of career pay days in foreign fields) and have shaped the game in their respective nations over the course of my adult life. These two players have been one club men in an era of very few such men. Gerrard and Xavi both made their debuts in 1998 just three years after the Bosman ruling came into effect. Club loyalty became almost as hard to find as any sense of shame in Sepp Blatter. Loyalty plus greatness leads to legendary status and both Gerrard and Xavi leave as club legends. They have embodied Liverpool and Barcelona for more than a decade and a half, defining the sides of which they were a part. They are both inspirational, selfless, and winners. They are also very different players. The first word that comes to mind when I think of Gerrard is drive; relentless and intense drive. At his peak, he imposed his will on the game and the opposition, seemingly everywhere, always committed to advancing and avoiding retreat. He would charge from box to box, brushing aside most that stood in his way, and with the goal anywhere in sight, unleash a ferocious shot that invariably induced panic in goalkeepers. Gerrard snapped into tackles and won many more than he lost. As a captain he preferred to lead by example and cajole those around him; very rarely did you see Gerrard launch the sort of violent tirades that were the stock in trade of someone like Roy Keane. The red mist would descend on occasion however. Gerrard’s sending off against Manchester United at Anfield in March was a dreadful loss of control from a player of his experience. Liverpool’s season never really recovered from that result and performance. The depressing finale to the season meant that Gerrard did not get the opportunity to add one more medal to his collection. The most famous and cherished of that collection is undoubtedly the Champions League winner’s medal from that extraordinary night in Istanbul. It’s that game which ensures Gerrard’s name at least warrants mention in debates about the greatest Liverpool player of all time. He somehow turned disaster into triumph with a rampaging performance that caused AC Milan to wilt just as they were expecting to waltz to an easy victory. I’m not sure which set of players were more stunned at the end but Gerrard knew he had risen to the occasion in a once in a lifetime experience. I was left shaking my head in disbelief as I think were most people watching. The one medal that has eluded Gerrard in his career is a league championship medal. Nobody would have believed that a Liverpool player making their debut in 1998 and being at the club for 17 years would leave without having won the league. The club came close last year and let’s not blame it on Gerrard’s slip. People seem to forget that Chelsea won that game 2-0 and did so quite comfortably. 3-3 at Crystal Palace was a much bigger and more significant stumble. Last season’s title charge now looks more and more like the combination of Suarez’s superlative form and glaring deficiencies elsewhere in the league. If failing to win the league is one major regret for Gerrard then the other must be his lack of international success as part of England’s so-called (and rather misnamed) ‘golden generation.’ The golden generation scarcely got near bronze far less gold, and silver linings have been thin on the ground. Gerrard had a fine England career but like the team generally, struggled to impose himself on the international scene at the very highest level. Gerrard is a technically sound but not supremely gifted footballer. The same is true of virtually all the players that Gerrard has lined up with for England. They are guilty of the second charge but it’s not because they lack the ability to pass the ball. Watch Gerrard ping a long pass at his best and it’s every bit as accurate and assured as what Pirlo, or Ribery or Xavi will produce. He can play cleverly weighted short passes as well including defence splitting through balls. So, if passing is not the issue for Gerrard and England then what is? In a word: movement. Throughout Gerrard’s career, the movement of the Spanish, the Germans, the Dutch, the Italians, the leading South American nations and many other countries (think of a small nation such as Croatia for example) has consistently been vastly superior to that of the English national team. Xavi embodies this difference. Watch Xavi play – it is especially clear when you watch him live – and you realise that the vast majority of the passes that he plays are incredibly simple. I could be successful with 90 – 95% of them. The key difference is in his movement and the movement of the players around him. For Barcelona and for Spain, just about every time Xavi receives the ball he has more options available than Gerrard has had for Liverpool and England. The intricate triangles that define tiki taka are created by movement and a sophisticated level of spatial awareness. This is what many English players lack and this is what leads them to concede possession so often. 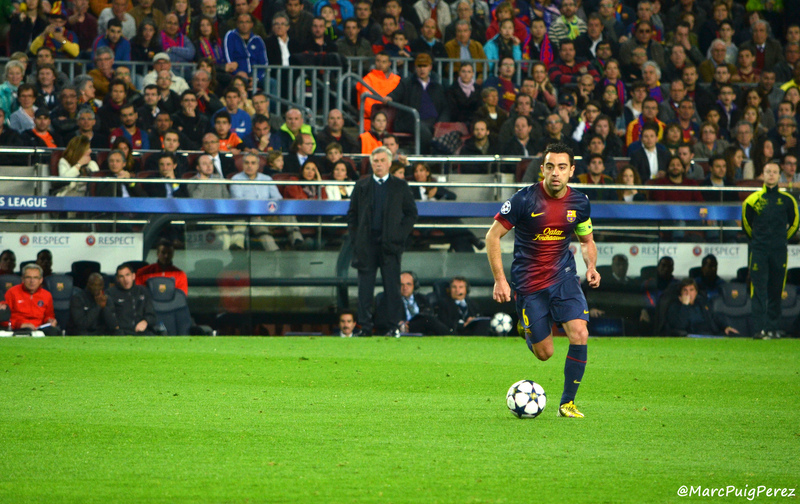 Xavi meanwhile has arguably the greatest awareness of space in the game. That helps to explain why he always seems to have a little extra time on the ball and a conveniently simple set of passing options. The game has got quicker over the course of Xavi and Gerrard’s careers, players have become more athletic, and defensive systems have become harder to break down. Each of these factors means that there is an increased premium on the ability to create and exploit space. Xavi is the master of it and so it’s little surprise that Barcelona have been the club side with the defining style of play of the last 15 years or so while Spain can justifiably claim that accolade at the international level. Xavi is a more technically accomplished footballer than Gerrard. His Barcelona and Spanish teammates are, for the most part, more technically accomplished that Gerrard’s Liverpool and England colleagues but more importantly, Xavi and his teammates have grown up with a different understanding of how to play football. The key to that understanding is the movement of players off the ball to create space and provide options for the player in possession. How many times have you seen Gerrrad receive the ball, turn, and then look up pleadingly for even a solitary passing option? When Xavi receives the ball and turns, he scarcely needs to look up because he knows not only that options will be available but what those options are likely to be. Tiki taka has recently been refined, not abandoned as some (including even Guardiola) have suggested. This season Barcelona have been more direct and as I’ve suggested elsewhere, their game is now primarily built on their front three rather than their midfield three as used to be the case. Xavi, like Gerrard, has not featured as regularly this season. He has often found himself starting on the bench. The Croatian Rakitic has had an excellent debut season at the Nou Camp, taking on much of Xavi’s role while also bringing a more muscular presence to the Barcelona midfield. It is to the immense credit of both Xavi and Gerrard that they have accepted their reduced roles with the utmost grace and professionalism. These two are team players, always prepared to sacrifice themselves for the greater good. Gerrard in particular has often played out of position and has usually excelled where others are often found sulking. Teammates should consider themselves very fortunate indeed to have played alongside these greats of the modern game. Both received farewells befitting of their legendary status. It was very sad all the same to witness Liverpool collapse so abjectly in Gerrard’s last game away at Stoke. Nobody could ever accuse him of abject collapse though and he salvaged professional pride with a characteristically committed performance and a coolly taken goal. Xavi may yet walk away from the Nou Camp with a treble to celebrate. He and his side are two thirds of the way there and face Juventus in the Champions League final on Saturday. The Italian’s are masters at denying space but I expect Barcelona to find just enough to win. After that, Xavi will head east (rather bizarrely in my view) to play for Al Sadd in Qatar. 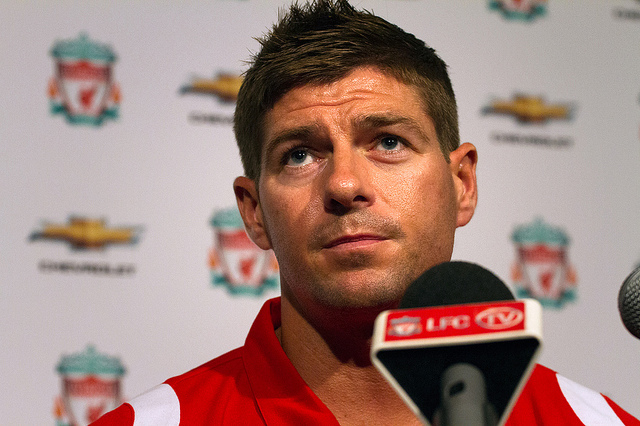 Gerrard is taking his Hollywood passes to Los Angeles and will be lining up for LA Galaxy. La Liga and the English Premier League are the biggest two leagues in the world right now. Xavi and Gerrard have been at the heart of the action in those leagues for almost two decades. Jetting off to different continents they can both reflect on the huge mark they have made on the European game. How interesting it would have been to see Gerrard try his luck in Spain or Xavi attempt to conduct the midfield for an English premiership team. Gerrard is good enough and intelligent enough that he would have adapted to a new style of play. Xavi is so good that any team he joined would probably have adapted to his version of the game and the space that he at once sees and creates. The FA Cup final will be played on 30th May 2015. Steven Gerrard celebrates his 35th birthday the same day. It will not be a cup winning party. Aston Villa’s thoroughly deserved victory over Liverpool was built on a performance of vigorous drive and aggression, the sort of drive that has defined Gerrard’s career but was sadly lacking in his and his side’s display yesterday. The game seemed to pass Gerrard by; he was more peripheral than central to the action. All the energy and swagger was in claret and blue. Liverpool turned up in yellow strips with white towels. Afterwards, Rodgers admitted that his team had been “too passive” and that the occasion had got to them. Ahead of the game, the Liverpool manager had spoken of a return to ‘Anfield South’ referring to a time when the club used to be very frequent visitors to Wembley. Not so much passivity in those days. Liverpool are already lacking in the leadership department and Gerrard’s departure will leave a gaping hole. Filling it will be very difficult, especially if, as seems likely, Liverpool do not qualify for next season’s Champions League. 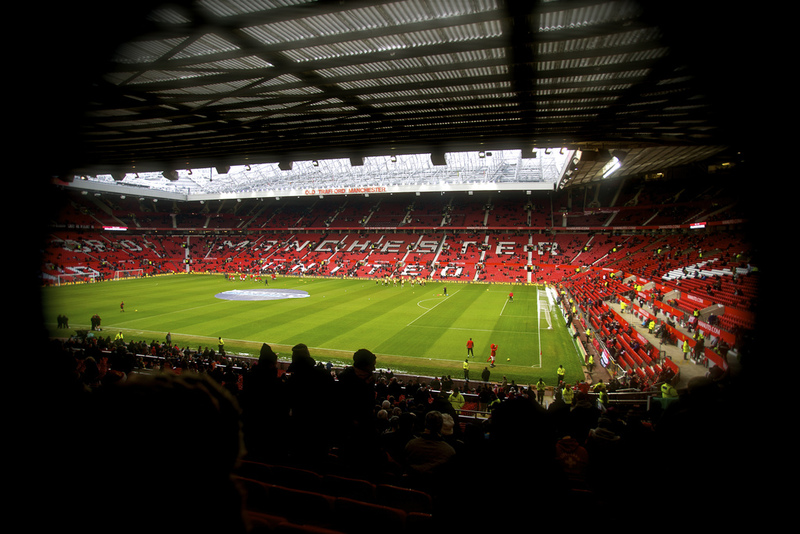 The team needs a significant overhaul despite the number of players brought in last summer at considerable expense. As a minimum, a new goalkeeper, at least one centre half, a central midfielder, a wide right player, and a centre forward need to be added. Rodgers started with Sterling playing at centre forward and three recognised centre forwards on the bench: Balotelli, Lambert, and Borini. Sterling is no false nine and selecting him in that position usually signifies a false start. So it was yesterday with Balotelli brought on at half time. The Italian’s dismal season continued as he missed a header (in a very literal sense – he failed to make contact with the ball), and was caught offside with such regularity that I began to genuinely wonder if he understands how the rule works. It would be a big surprise if Mario is still at Liverpool next season. Initially I thought that he was probably worth a £16 million gamble but I was wrong. It’s not a good combination for a centre forward to be high maintenance and low scoring. At the other end of the pitch, Benteke offered everything that Balotelli appears capable of but so frequently delivers. The Villa forward scored a well taken goal, constantly troubled the Liverpool defence with his power and pace, and selflessly led the defensive line from the front. Unlike Balotelli though, he was ably supported by willing runners alongside and often beyond him. Sherwood’s side surged while Liverpool looked as though they had suffered a power cut. Gerrard, so often the repairman, appeared powerless to fix things. Coutinho, by far Liverpool’s best player this campaign, provided a small spark but it burned only briefly before being smothered by Villa’s pressing intensity. The game was a reflection of Liverpool’s season: not performing on the big occasions, giving away soft goals, and not carrying a sufficiently sustained threat in attack. Rectifying these issues will not be easy and is unlikely to be cheap. Rodgers must invest much more wisely than he’s done so far. Rumours today suggest that Falcao might be a part of the rebuilding work but his travails at Old Trafford this season have been such that he must now be considered a rather risky investment. Still, he’s a player of genuine Champions League pedigree and those are in short supply at Anfield at the moment. The excitement of this time last year now seems like a long, long time ago for Liverpool fans. As those fans returned north from ‘Anfield South’ yesterday, they must have been wondering what will happen next, after Gerrard heads west. It is 14 weeks since this blog was launched. Apparently, on average, this is around the time that many bloggers give up. It proves to be a bit harder than imagined, a bit more time consuming, and the number of people viewing on a typical day would fit comfortably into a Cinquecento. The goal at launch was to post at least once a week. This is post 11 so we’re a little behind schedule and that’s partly why I’m going to attempt to post every day in November. The aim is to quickly generate quite a lot of content for the site and also experiment with a few different formats and types of post. The average length of post on this blog is between 1,200 and 1,500 words. Brevity has never been my strong suit (my PhD thesis eventually crawled to a conclusion at 95,000 words – it now works well as a bedtime story for the kids, they go straight to sleep) but some posts over the next month are likely to be considerably shorter given the self-imposed time pressure. I’ll even tweet about it (@ciwilkie) in a bid to discipline myself with 140 characters or fewer. Gerrard is an honest footballer. You’ll never catch him giving less than 100%. You’ll never catch him hiding. You’ll never hear him give a less than honest assessment of his own or his team’s performance. Yesterday I read an interesting and typically honest interview he gave to the Daily Mail. He revealed that Liverpool haven’t offered him a new contract yet. 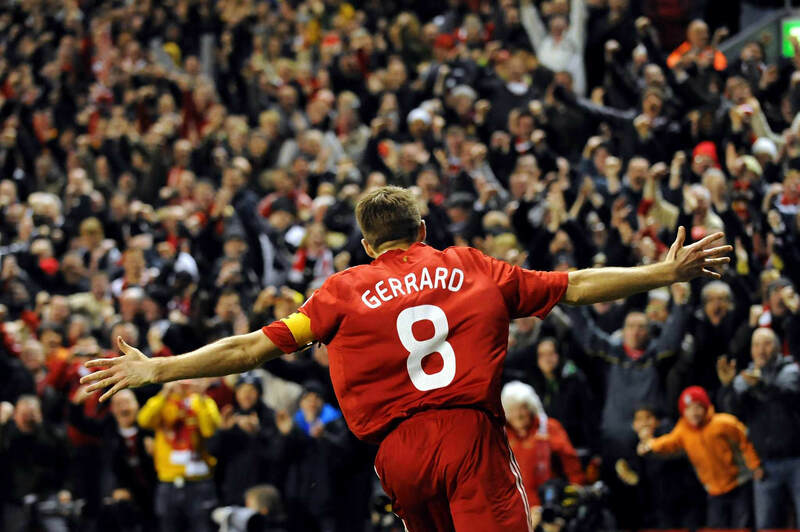 His current one expires next summer and Gerrard insists he has no plans to retire. I’m sure an offer will be forthcoming (and would expect it to include the option of a coaching role) and if not, he’s hardly likely to be short of suitors elsewhere. The banana skin nature of his Chelsea slip ensured it would be subject to future ridicule but it’s quite ridiculous to suggest that it cost Liverpool the title. The last few games of the campaign showed that Liverpool were a little too lacking in guile and experience to be champions and that would still have been the case if Gerrard had not slipped. If Liverpool don’t retain his services then there seems a good chance he would choose to go abroad. It’s something I think he could and should have done a while ago. I could imagine him being a success in the same way that Paul Ince, a very similar player to Gerrard, was at Inter Milan. Manchester City – crisis, what crisis? Robbie Savage, a pundit who lives up to his name, has used his BBC column to stick the boot in to City after a disappointing week for the club. Sticking the boot in came naturally to Robbie throughout his playing career and he’s taken the same studs up approach to his analysis. He claims that those who say City are ‘on the brink of a crisis are not far wrong.’ Savage’s thesis is that City aren’t going to win the Champions League (almost certainly true), that they might not even qualify from their group (it’s far from certain that they will) and that if they fail to beat Man U in the derby then they’ll fall dangerously far behind Chelsea (who Savage thinks won’t lose three times all season) in the title race. If City are in crisis, or even on the brink of it, then it’s a condition that most clubs would settle for. Of course the huge sums that have been invested at the Etihad bring correspondingly large expectations. The team has disappointed in Europe but they have yet to experience any luck in the Champions League draw. Chelsea do look like the team to beat this season but I’d still be amazed if City are not their nearest challengers, and genuine challengers at that. Impressive though Chelsea’s start has been they would quickly become quite vulnerable with a few injuries to some key players and just as with Balotelli, it all feels a little early to be reaching firm conclusions. Pellegrini is shrewd and calm. He won’t panic and he’s been around the block enough times to know that a few poor results don’t make a crisis. I expect City to win the derby tomorrow and if they follow that up with a result in the Champions League then all of a sudden the supposed crisis will evaporate. Savage’s studs will then have to seek a new target. Well, as this post heads towards 1,000 words I’ll stop with day 1 of blogvember successfully ticked off. If you have any thoughts or suggestions on this blog (posts you’ve particularly enjoyed, things you’d like to see) then please leave a comment below. Be as honest as Gerrard but slightly less savage than Savage.